Siamese cats are famous for being vocal. Well, ours surely are. 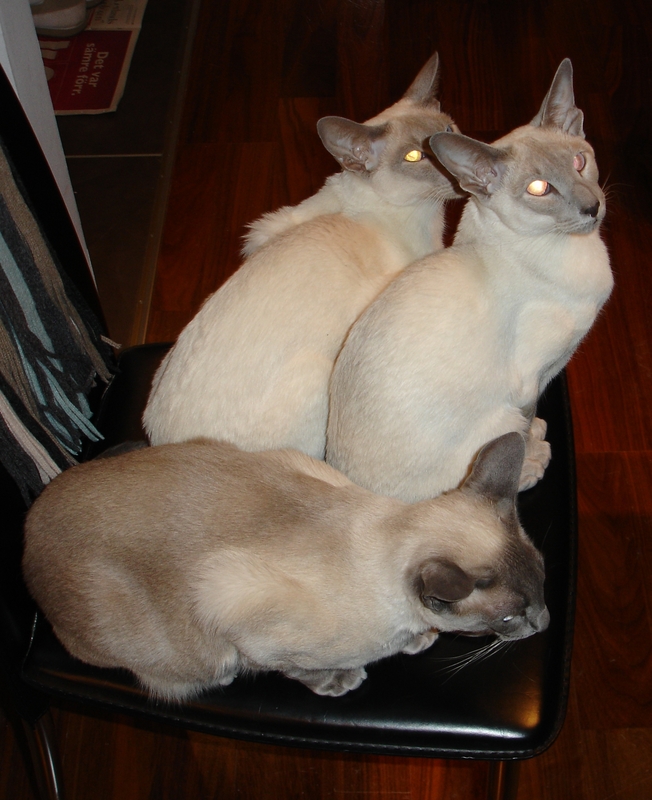 Even Maven (who is mixed race) talks a lot with us, not less than the other three cats, although she can not produce all the fruequences Siamese can. When Angel came to us, she “talked” in a very thin, high pitched voice, like her mom does. But now she has changed her meow into an intense, mighty roar, very similar to her sister’s and father’s. The influence of the group she is in now. A beautiful blue point Siamese named Angel, Josephine’s sister, moved in to our place a few days ago! It is not easy to get four grown-up cats to get along well. Cats reach their social maturity between 18 months and 4 years, and we think that only Maven may be socially mature here. Leroy started changing and adjusting his behaviour recently. He became less off a rebel and more pettable. He even started purring sometimes again. The plan is to have Angel at our place until Jossan gets kittens (some time this year, we hope) and find her a new home with one of the kittens. We want to minimize the emotional stress of moving too many times, living with too many different cats. So, the next, and hopefully last time she moves, it will be with a kitten she knows and is friends with – a little niece or a nephew. Angel has a similar temper to Leroy and they already play together. Leroy is a very social cat and good in making friends fast. Jossan is very jealous and spends most of her time clinging to Jelena, claiming her and showing to the world that Jelena is her human. Jossan is a kind of cat that bonds with one person. Angel is like that, too, and she should bond with Joakim, otherwise we will have a problem. Maven, who is the dominant cat in the cat group is not happy that there is one more cat to take care of and is occasionally disciplining Angel through terrible “MrgnMrgn” sounds when Angel comes too close to her, or looks a bit too cocky. There has been a paw or two lifted as well. Cats avoid fights and conflicts as much as they can, and usually they solve many problematic situations through making really scary sounds, staring down the opponent etc.